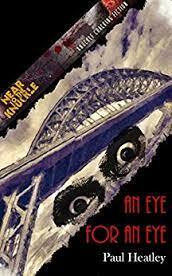 I am sorry to say that the initial release of Paul Heatley’s An Eye for an Eye, came and went and it was never on my radar. Sometimes the sheer volume of books being released means even great books go unnoticed and this book is a great example of why it’s important to visit the websites of the independent presses you like just to see what may have slipped past you. I recently visited Near to the Knuckle’s website and I am pleased to say this great read came to my attention. This is a shotgun blast of a novella and it has put Heatley on my radar in a big way. Heatley has penned a dark, brooding, atmospheric slice of violent noir. Everything about this novella is done right; from the attention to the setting which helps set the bleak mood the story emanates, to the well fleshed out characters that come to life and breath the air of believability into the story. Heatley hits every high note, but does it with a poet’s touch. His characters, which were originally introduced in the short story The Straightener, are well fleshed out. Graeme, not the toughest thug on the street, is his main character. Graeme’s strength is his morality that comes through in a real-world manner; he doesn’t believe he is a moral man, but he knows his morality stands above the other thugs who reside in the same world as him. He displays a touch of compassion, without being pushover. Graeme gets the call when the daughter of top mobster, Neil Doyle, loses an eye in an accident. Doyle, a man who makes anyone pay for making him look weak, will move heaven and earth to make the guilty party pay and he puts Graeme on the case. Graeme teams up with Tony, a non-affiliated man whom he knows he can trust. By looking outside the mob circle for a right hand man, Graeme lets us know that he is not a man on a leash, instead he is a free thinking man who balances the need to get the job done, with the knowledge that a job needs to be done right to be completed. This novella is a brutally violent masterpiece. From dismemberments, heads concaved in from forceful hammer strikes, to men being comatosed though violent means, it has something for every noir and hardboiled fiction lover. This book screams to be read and recognized for the many strengths it possesses, and Paul Heatley deserves to be recognized for his ability to strip a novella down to its barest elements and have every one of them add a vital piece to a kickass story. There is nothing extraneous in this story, yet nothing is missing; indeed a hard balance to accomplish. While this novella stands on its own, be smart and head over to http://www.close2thebone.co.uk/wp/?cat=135 and read The Straightener before you dig into this one. While you are there, check out all of the other great things Near to the Knuckle has put out recently. I for one will be seeking out quite a few of their older titles and you will be reading all about them in the future.